A network of corridors weave throughout the structure. The upper floor hosts a huge empty throne that overlooks the bonfire below, which can be lit with the Coiled Sword. Behind the fire is a small set of steps leading to an altar. Could the stonework that supports this building be the same as that which forms the crumbled ruins around the Firelink encountered in another time? Though it may not be exactly the same, it is still probably located above the place where the Fire is linked. Perhaps this is evidence that Lothric and Lordran are the same as well, or somehow inexplicably linked. There is a decrepit bell tower behind the Shrine that serves as the grave of Fire Keepers past. Not much lore - besides the name and presence of multiple NPCs, in addition to being a world hub - supports this theory. The images on the right do though. 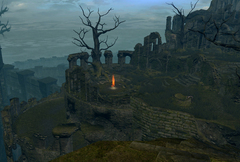 The first image is a screenshot taken of Firelink Shrine, from Dark Souls 1, and the second screenshot is taken from Iudex Gundyr's boss arena. So, this Firelink Shrine is also the Kiln of the First Flame, hence the black knights. Firelink and the Kiln exist outside of time and are sort of multidimensional with a plethora of alternate realities that are all possible. There is the one you spend most of the game in which is the current universe you're working in. 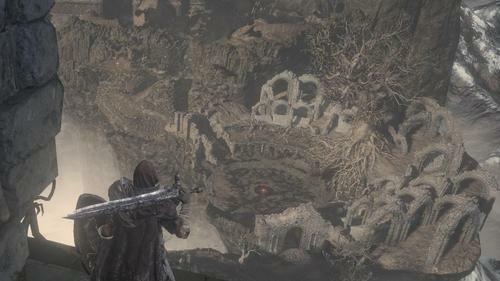 The shadow shrine is one of two possibilities: it could be the past because of the presence of Champion Gundyr, or it could be what the eyes of the Fire Keeper reveal to be a truth of the world without flame, which is why there is no bonfire in that Firelink. Finally, we have the Kiln firelink which shows the ruined kingdom of Lothric. Either that is in the future, or this reality Lothric and everything else was destroyed when the kiln merged with reality from it's own sort of pocket dimension. Sword missing from the shrine bonfire. Cannot be equipped as a weapon. Thrust into the shrine bonfire to restore its power and enable travel between bonfires. This sword is only bequeathed to chosen ash, as judged by the Iudex, who awaits the arrival of ash as a scabbard. Key to the decrepit tower behind Firelink Shrine which leads to the Bell Tower. The Bell Tower is the grave of the Fire Keepers past. When a Fire Keeper has served her purpose, she is led to true darkness, where she enjoys a long-deserved sleep.